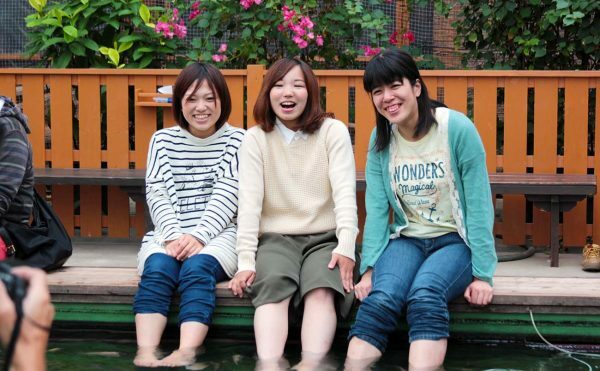 You can come in contact with capybaras, the No. 1 most soothing animal. 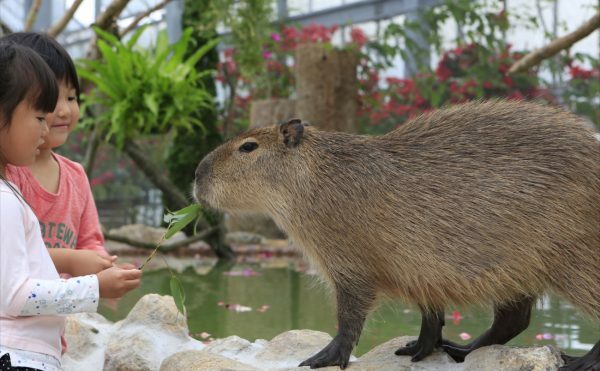 You can also give the capybaras sasa leaves, their favorite food! There are maras in the same area, and you can enjoy coming in contact with and feeding them as well. ※Will close once animals have eaten their fill. 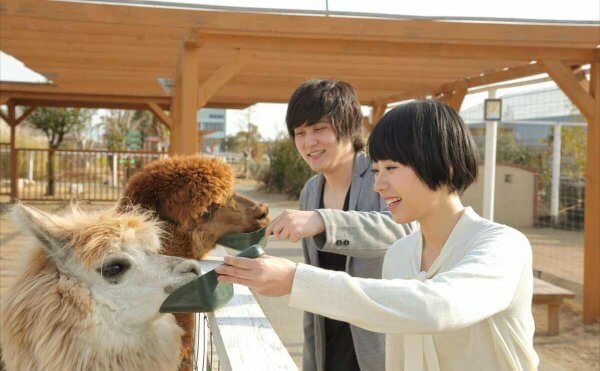 You can come in contact with the three alpacas living in the Alpaca Space of our Outside Park and give them snacks. We hope you’ll feel rejuvenated by their fluffy coats and big, soulful eyes! * Will close once animals have eaten their fill. Toucans are birds with gigantic bills that inhabit subtropical areas. They are gentle and amiable birds who will fly to you and land on your arm or shoulder if you are holding food. you’ll feel like you want to take one home with you! 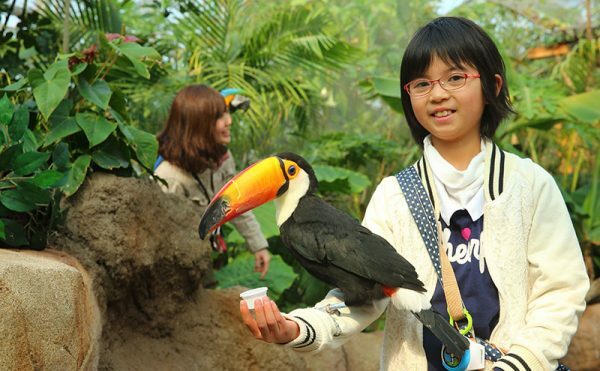 This is a rare opportunity to see toucans up close. You should certainly try to get one to land on your arm! You can give snacks to the kangaroos. See if you can find a favorite one! 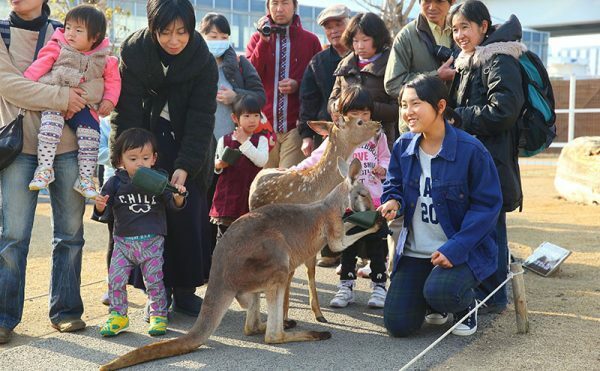 You can also come in contact with chitals (axis deer) and feed them in the same way. 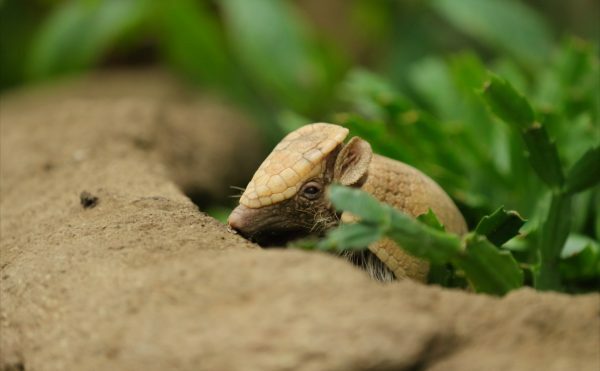 Newly on exhibit in our Tropical Forest are the Brazilian three-banded armadillos! The charming sight of them rolling and toddling around is sure to relax you. Try touching their hard, smooth carapaces! 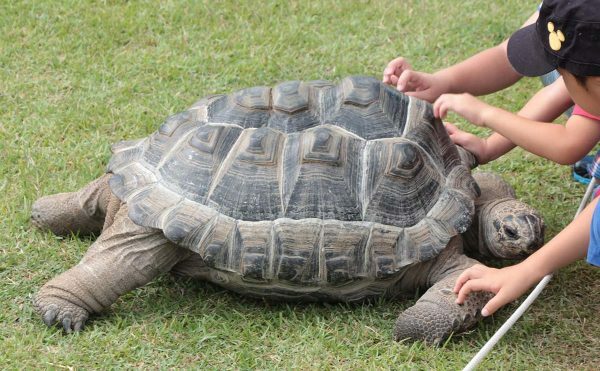 You can experience feeding the giant tortoises. Feel free to come in contact with the tortoises’ way of life with fruits and vegetables. * Please note that the tortoises may be moved indoors or out depending on the temperature or weather. 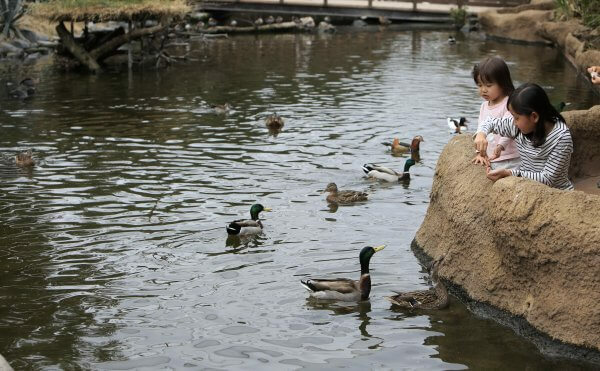 You can encounter and feed a variety of shorebirds, including ducks, mandarin ducks, and black-winged stilts, at our Pelican Lagoon pond. These engaging, colorful shorebirds will quickly approach you. 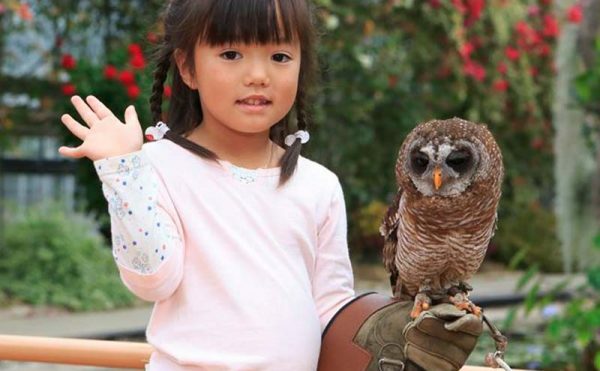 Following our bird shows, we allow guests to let owls perch on their arms. You’ll don a special glove, let an owl perch on your arm, and a commemorative photograph will be taken with the camera you have brought (fee will be charged). Don’t miss a chance to experience this after our bird performances! ※Follows bird performances conducted at each hour. 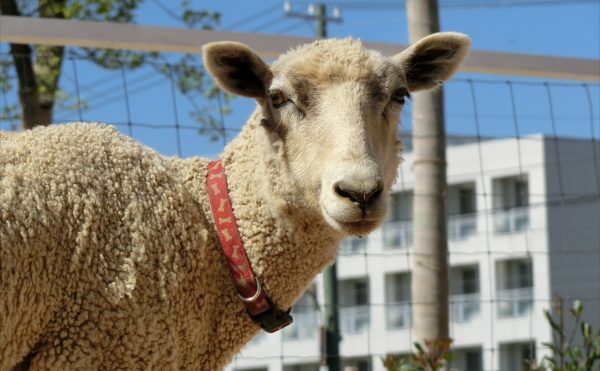 Cute sheep live together in our sheep area. You can experience feeding them. Our parrots, both small and large, fly and walk freely throughout a space full of perches. 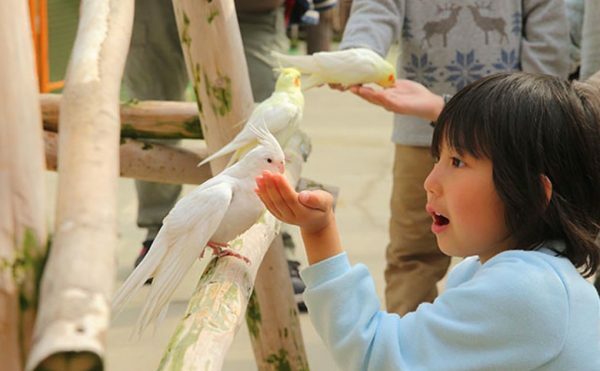 Guests can freely interact with and feed the birds in this area. We hope you’ll find and play with one you like! * On days such as weekends and holidays where crowding is expected, a 20-minute time limit or a restriction on the number of participants may be imposed. * Please note that you may not be able to fully enjoy contact with our birds due to their physical condition or moods. 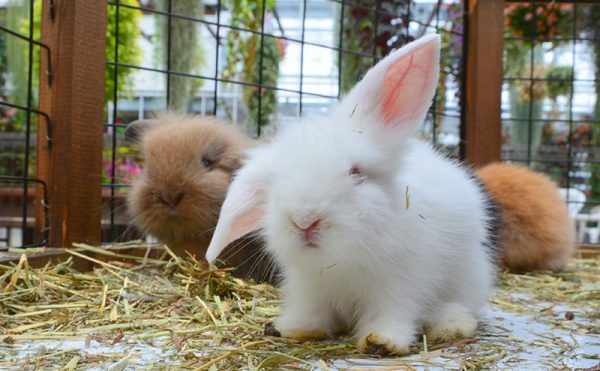 At Pyeong Touch , you can interact with rabbits and guinea pigs. You can also feed them. Be sure to play gently! 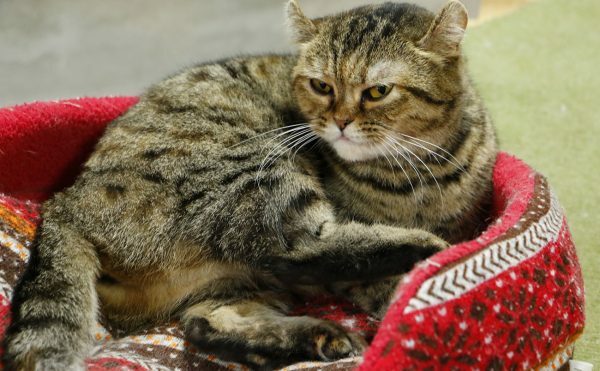 Our adorable dogs and cats await your visit, living peacefully in the same room. We hope you’ll pet them nice and gently and be their friends. Our Contact Fish Corner is on the north side of Water Lilies. The fish you’ll interact with are ones that typically eat the old outer layer of human skin. If you place your feet in the tub and stay still, you’ll feel their tiny mouths poking at your feet and making them clean! * Fish may not approach depending on the temperature of the air or water and the hours of operation of this corner may change or be canceled. * We ask that our guests with thin skin, small children, or open or healing wounds refrain from entry.